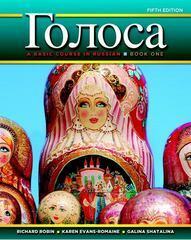 Golosa: A Basic Course in Russian, Book One 5 Edition The Fifth edition of the best-selling communicatively based text for beginning Russian is enhanced by a greater focus on contemporary culture and simplified, visual grammar explanations that will better engage your students. Golosa : A Basic Course in Russian, 5e strikes a true balance between communication and structure. It takes a contemporary approach to language learning by focusing on the development of functional competence in the four skills (listening, speaking, reading, and writing), as well as the expansion of cultural knowledge. It also provides comprehensive explanations of Russian grammar along with the structural practice students need to build accuracy. Golosa is divided into two books (Book 1 & Book 2) of ten units each. The units are organized thematically, and each unit contains dialogs, texts, exercises, and other material designed to enable students to read, speak, and write about the topic, as well as to understand simple conversations. The systematic grammar explanations and exercises enable students to develop a conceptual understanding and partial control of all basic Russian structures. This strong structural base enables students to accomplish the linguistic tasks and prepares them for further study of the language.